The Spring/Summer 2013 season was defined by an aspirational type of beauty which had casting directors, designers and stylists on the look out for newcomers whose looks were not only distinct but more so compelling. Seventeen year old Yumi Lambert with her hybrid mix of Belgian and Japanese heritage perfectly encapsulated the mood for the season. The seventeen year old green-eyed, elfin-like beauty emerged as one of the standout newcomers of the season with riveting appearances at Marc by Marc Jacobs, Prada, Fendi, Missoni, Miu Miu, Yohji Yamamoto, Christian Dior and Chanel. Represented globally by modelling powerhouse IMG, Lambert is well positioned leading into the Fall/Winter 2013 season having scored a coveted spot in the Chanel Spring/Summer 2013 campaign alongside industry veteran Stella Tenant and fellow teen sensation Ondria Hardin. Lambert took a breather from her frenetic schedule to chat exclusively to Inoubliable Model Army about being the first Belgian to star in a Chanel campaign, the pros and cons of runway "exclusives", and modelling's great escape. Inoubliable Model Army: Hi Yumi, you must be buzzing following your stunning debut season with a total of 25 show bookings. How did you feel overall about your debut outing and what were the highlights of the season for you? YL: Hi! I was really excited and nervous about my first season but I was also so happy to be a part of it all. For me there were many highlights, beginning with Marc by Marc Jacobs in New York and then literally every show I did in Milan and Paris. Inoubliable Model Army: You possess one of the most striking and original faces that the modelling industry has seen in eons. Tell us a little about your background and how you got into modelling? YL: I'm from Belgium and am a quarter Japanese from my dad's side. I'm 17, soon to be 18 in April and started modelling when I was 15. I was not really discovered or scouted, but instead went into an agency myself and asked if I could be a model. I hope to model for a long time and to continue to grow and progress more. Inoubliable Model Army: Your bi-racial looks have drawn comparisons to former top model Devon Aoki. Are you familiar with Devon and how do you feel about the comparison? YL: Yes, of course I know of her but not personally. I think she is a really beautiful woman and I'm really happy that people associate me with her. I only hope to have achieved a similar success by the end of my career. 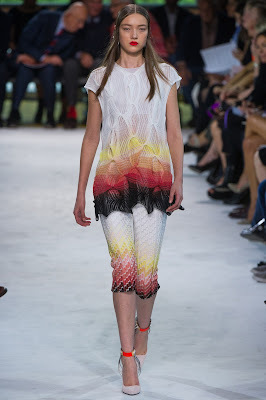 Inoubliable Model Army: You look amazing both on the runway and in print. Do you have a presence for either and what would be your dream assignment? YL: Thank you, I really like both. 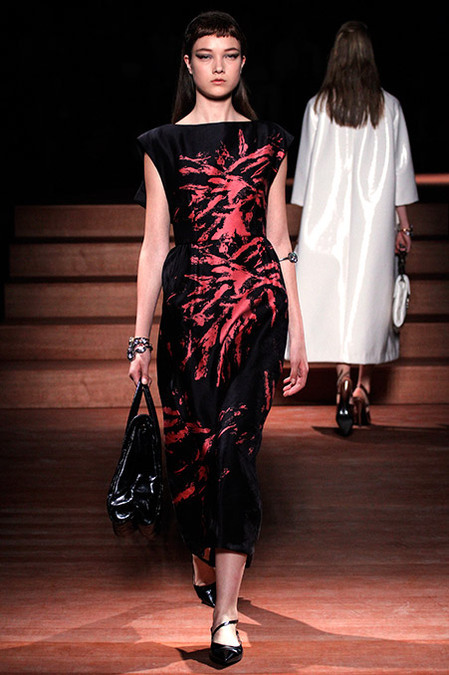 The runway gives off a really incredible energy while print work offers something totally different but I love it. I would love one day to be a Victoria's Secret Angel, it's a little bit of a dream for me and one of the reasons why I started modelling in the first place. 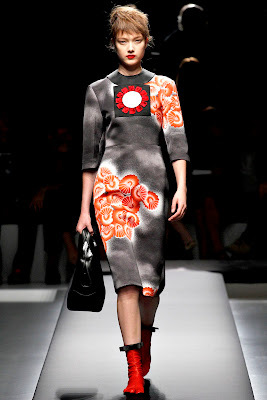 Inoubliable Model Army: The major breakthrough point for you this past season was your exclusive appearance at Prada. What did the casting process entail and when did you find out that you had been confirmed? YL: The casting process was really long because there were a lot of girls in attendance (one day I spent the whole time at the casting) and it involved overall three days of castings and fittings. I discovered that I was confirmed the day after the casting and I was really excited! Inoubliable Model Army: Do you feel in general that "exclusives" are good /bad for a new model's career and why? YL: I think that exclusives for a new model's career is not really the best thing because often times people don't even realise that a girl may be up for an exclusive and instead presume that we are not really working due to lack of visibility through other clients. So I don't feel that exclusives are perhaps the best thing in the beginning of a model's career. Inoubliable Model Army: How was it coming into the shows as a newcomer and did you form friendships with any other models? YL: Yes I met many girls. Modelling is a job where we are far away from our family and friends so it's really important to form new friendships so that we are not forced to be alone which would be no fun for anyone! Inoubliable Model Army: What are the biggest misconceptions about models and the industry? YL: This is really not an easy job, yes it is easier than some other jobs but in this profession we don't get to see our family, friends or boyfriend sometimes for months. Also when we are feeling tired, we can't say "sorry it's not possible today...", and instead we need to project a happy and fresh attitude. Inoubliable Model Army: What aspects of modelling do you like or dislike most? YL: I really enjoy visiting and seeing a lot of countries. I also like modelling because when I'm working, I'm not really thinking about the rest of my life. It's kind of provides an escape, kind of like when people go dancing. As for my dislikes, I don't get to see my old friends very much, maybe one day per month. Models are every time in different countries and I am always having to say no to a lot of familial events. Sometimes also, a job may be confirmed only a day before, so then you have to cancel all personal engagements with family and friends. Inoubliable Model Army: You recently landed a major coup - the Spring/Summer 2013 Chanel campaign shot by Karl Lagerfeld alongside models Stella Tenant and Ondria Hardin. How did you feel to be shooting such an prestigious campaign for such an iconic fashion house? YL: Shooting the Chanel campaign was amazing! The shoot took a long time because we had to have all the hair and make-up ready before Karl arrived, but after it was a really fast and stress free process to take the pictures. Stella was amazing and I think that Karl is happy with the campaign. It's difficult for me to describe because for me it was like a dream come true plus I am the first Belgian to ever appear in a Chanel campaign. Inoubliable Model Army: What are your goals and hopes for the future? YL: I hope to model for as long as possible and if I had to stop, I would like to remain in some aspect of the fashion industry. YL: I think my green eyes and being Asian, and also my personality (I'm staying every time myself, I don't try emulate other girls). I look like a little doll and I love to play with this but I can also look really strong in some pictures. Also even though I am young, I can be really mature, professional and am able to talk about everything.